In yesterday's update, the preferred short-term count expected the S&P 500 to decline to 1461 +/-, then reverse to new highs. 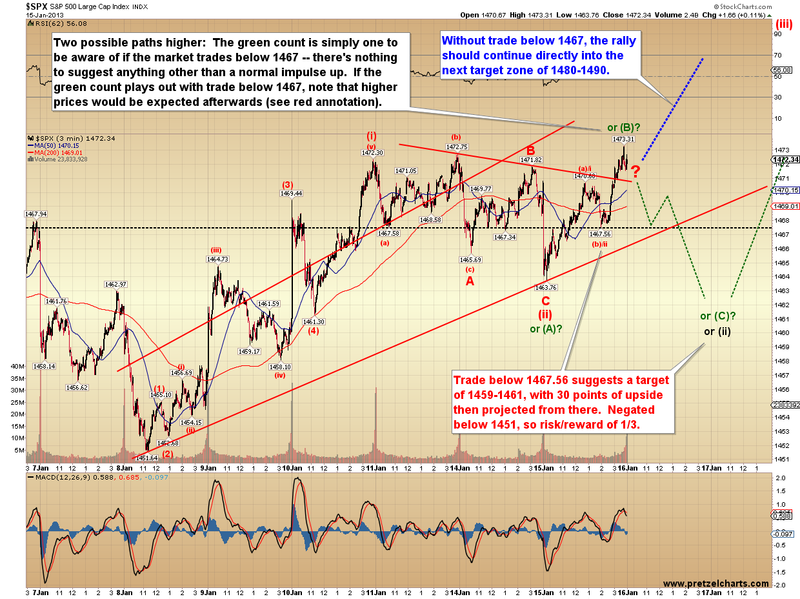 The market found a bottom two points shy, at 1463, then moved up to make a very marginal new high. 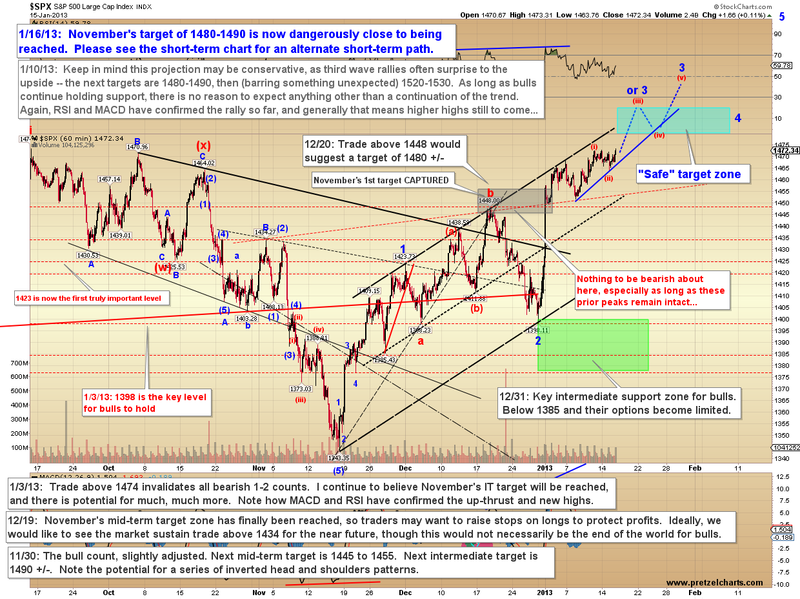 Normally, we'd now expect a standard five-wave impulsive rally to unfold over the near-term, but I've outlined a second potential path because the option's still open, and I have a suspicion about what the market may be planning here for the short-term. Targets for the two most-likely near-term paths, and levels to watch to differentiate the two, are listed on the chart below. Note that both short-term counts presently expect this move to resolve higher, this is simply an option to be aware of, because expanded flats (the green path outlined above) often get traders on the wrong footing, since they almost always kick out the last swing low before reversing higher -- in other words, they behave just like the move I predicted yesterday. This is basically a larger fractal of the same type of structure. The hourly SPX chart is shown below, and there's nothing in the charts yet to suggest that November/December's upside target zone won't be reached -- though the market has now come within 7 points, and sometimes "within a few points" is as good as it gets in this business, especially for long-standing targets. The main thing bothering me right now for equities has nothing to do with the equities charts: I've been trading the euro/US dollar currency pair all night, and I suspect euro is on the verge of a steep decline toward 1.312-1.314 in the next few sessions. 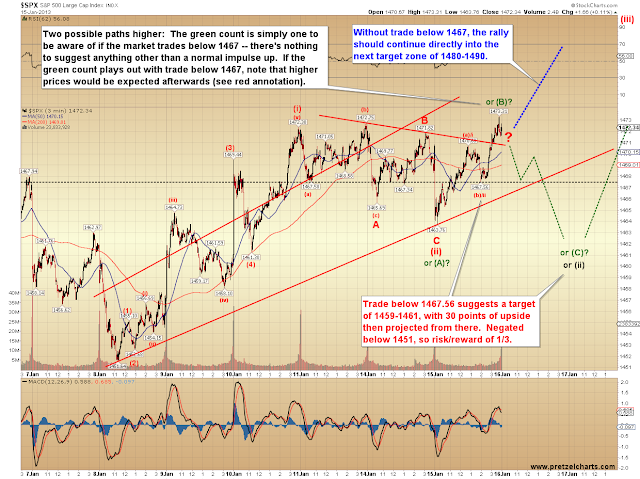 Although there's no guarantee this will impact equities, it's a factor to remain alert to. 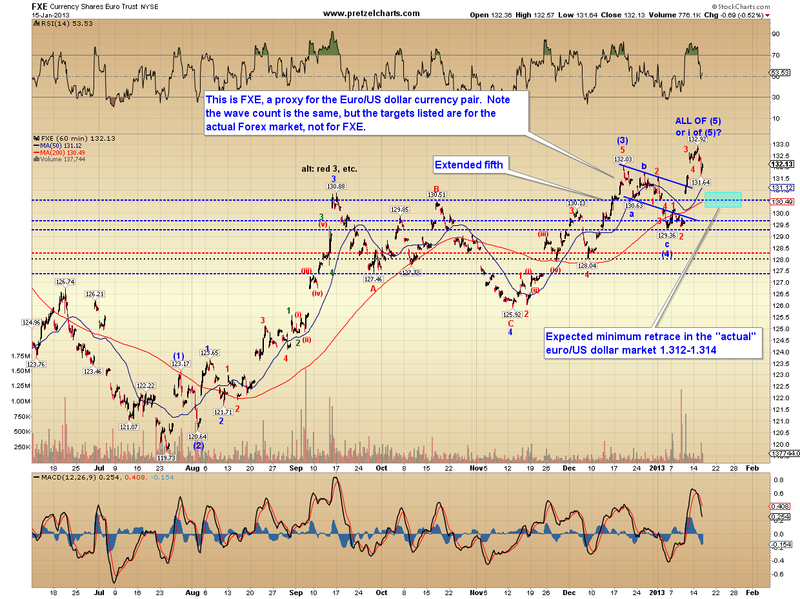 Below is a chart of the FXE currency shares euro trust. 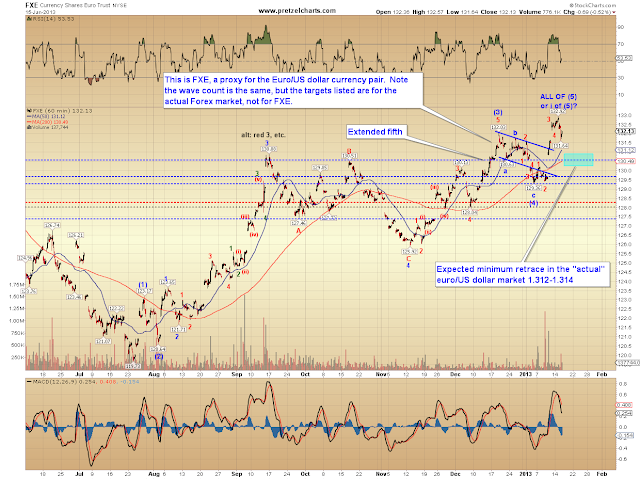 While the numbers here vary slightly from the actual Forex market, the wave count is the same. The retrace target is listed using the actual Forex rates -- if the most recent rally was all of wave (5), then an even deeper correction will ensue. NOTE: Intraday real-time adjustment on Euro -- I reworked my micro count in Euro/USD and it is entirely possible that an ABC completed at last night's low. It all comes down to key support now: as long as 1.32559 holds as support, it may move to new highs from here... and bears probably don't want to see it back above 1.33471 at this point, or it could easily go back into launch mode. Below 1.32559 and the target becomes active. In conclusion, as I noted yesterday, there are some signs for caution, and the "easy money" part of the rally may be over for the time being -- nevertheless, the equities charts currently point higher for the mid-term. It remains to be seen if my read of the Forex market is correct, and if so, how this may impact equities over the near-term. Trade safe.